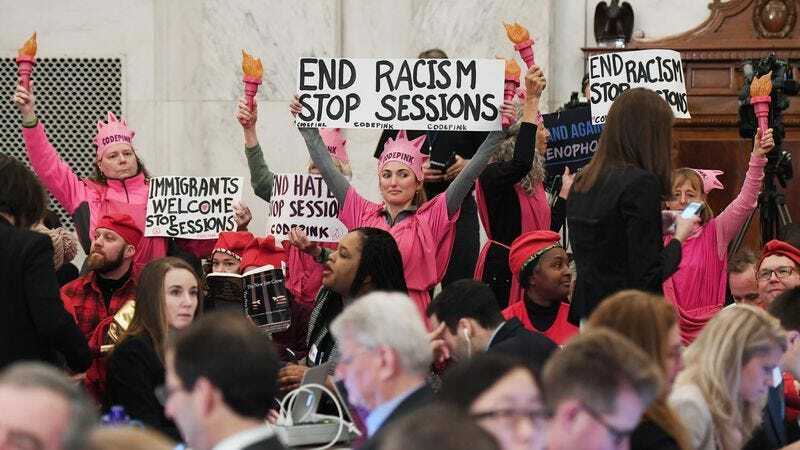 You may have heard that the U.S. Attorney’s Office for the District of Columbia is prosecuting three activists from the group Code Pink for their actions to “impede and disrupt” confirmation hearings for Jeff Sessions earlier this year—one of whom says, according to The New York Times, that she did nothing more than laugh. Specifically, she laughed at Senator Richard Shelby’s statement that Sessions’ record of “treating all Americans equally under the law is clear and well-documented,” given that the evidence to the contrary is also quite well-documented. Well, the trial ended yesterday, and according to The Associated Press, today a jury convicted Desiree A. Fairooz of disorderly and disruptive conduct and of parading or demonstrating on Capitol grounds. Meanwhile, Tighe Barry and Lenny Bianchi, who dressed up as Klan members and “cheered” Sessions on during the hearing, were acquitted of disorderly conduct, but were both convicted of parading or demonstrating. Depending on the outcome of their June 21 sentencing hearing, the protesters face $2,000 in fines and/or up to a year in jail. This is not reminiscent of anything being depicted in any of our popular culture at the moment, and is totally normal and fine.